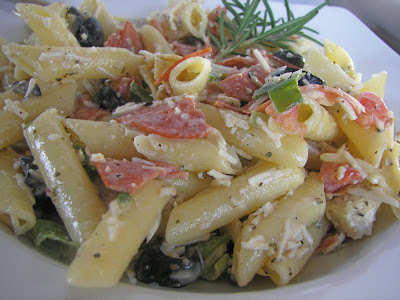 Parmesan Pepperoni Pasta Salad was on the menu last night at our home. We dined on the the deck last night. I am so happy some warm weather has decided to come our way. I am determined to eat outside as many nights as possible! This recipe is one of my own that is a "go-to" recipe when our nights are busy. You can make it ahead of time and place it in the fridge until dinner. In fact, you should make it ahead several hours before serving to allow the flavors to meld together. So quick and easy peasy! Serves around 6. 2 cups shredded parmesan cheese -- Do NOT use the stuff in a green can. You can freshly grate your own or buy it in a 6 ounce bag in the cheese section; this is what I use. 1 cup creamy caesar dressing -- I used Ken's Steak House; there is also a light version. Fresh herbs to garnish -- I used rosemary. Place pasta in large cooking pot with 5 to 6 quarts of cold water. Bring water to a boil and then salt water to season pasta. Cook for 8 to 12 minutes until al dente. Take pot off stove and rinse pasta in a colander until cool. Add pepperoni, parmesan cheese, olives, onions, artichokes, tomato, garlic, and oregano. Then add creamy caesar dressing and add salt and pepper to taste. Garnish with fresh herbs. This sounds and looks like something I would LOVE! We too eat outside every moment we can through the summer. There is so much pollen right now, it's a chore cleaning everything off though! What a GREAT!!! 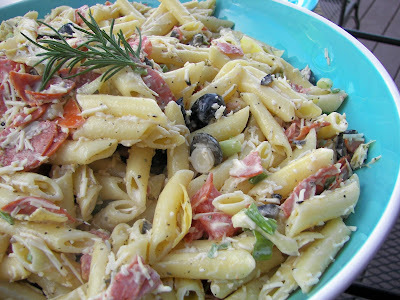 pasta salad. I love the combination of flavors. Mixed this up this morning and could barely stay out of it! So yummy! Can't wait for dinner to hurry up and get here! Looks great! I'd love to come for dinner!